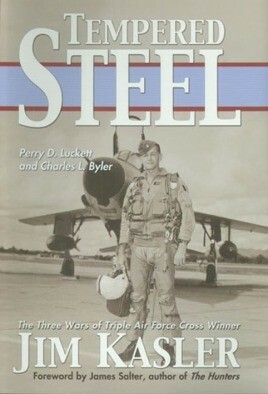 Perry Luckett and Charles Byler have written the first biography of Col. James Kasler, who is the only three-time recipient of the Air Force Cross, the second highest medal for wartime valor. Unfortunately, due to sales rights restrictions, we cannot offer Tempered Steel for sale in your country. Perry Luckett and Charles Byler have written the first biography of Col. James Kasler, who is the only three-time recipient of the Air Force Cross, the second highest medal for wartime valor. Kasler served as an eighteen-year-old B-29 tail gunner in World War II, became a legendary jet ace in Korea, and was so famous in Vietnam that he was known by name in the White House. Major General Hoyt Vandenberg put Kasler, along with Chuck Yeager and Robbie Risner, as "head and shoulders above the rest as stick-and-rudder pilots."